Way of the Fighter brings old-school fighting video games to your tabletop. And one thing about those games is that they usually had quite an array of fighters, of all different looks and fighting styles. Well, Way of the Fighter looks to be no different. They've got another Fighter Pack available for pre-order. This time around, you can pick up Brahm and Cobalt. Way of the Fighter is an expandable card game that captures the look and feeling of an arcade-style fighting game. It’s simple. Two challengers, one arena, and all out close-quarters mayhem! The game primarily involves bluffing, resource management, and tactical positioning. 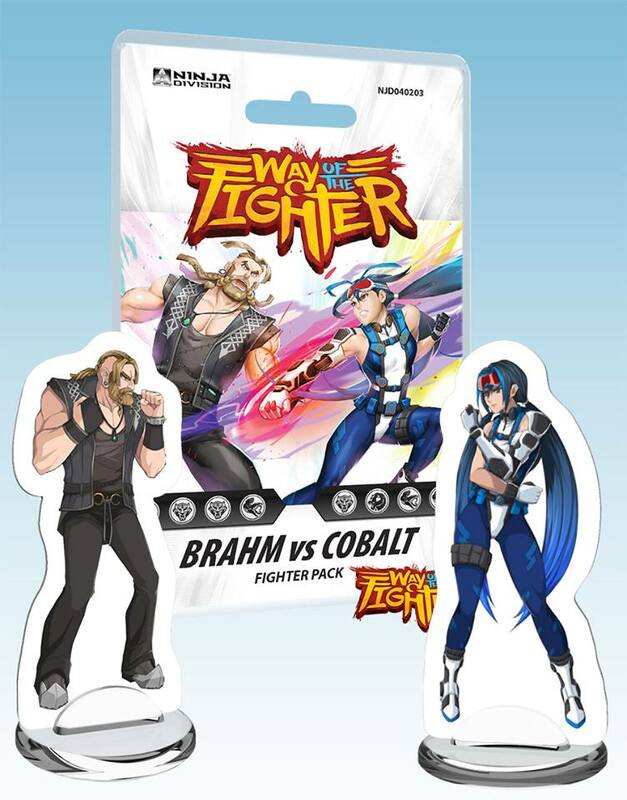 This fighter pack includes a complete set of actions for Brahm and Cobalt, along with their fighter standees. In addition to the two new fighters, this pack includes two complete sets of actions for the Push technique belonging to the Hard style and the Slam technique belonging to the Fluid style. Over a period of twelve intense turns, each player will control a fighter’s movement, manage the fighter’s energy, and decide on what actions to have the fighter perform against the opposing challenger. The game continues until one fighter is knocked out, or the time runs out; at which point one fighter will be declared the Champion!